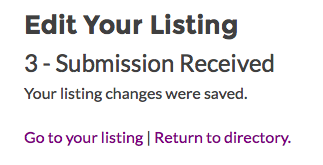 If you have a listing already published in the Directory, you can go back and edit any of the information you want. If you have not uploaded any pictures, you may also do so. If you have not created a listing already, please go here. Go to the directory listing page here. Scroll or search for your listing. Be sure and use the LOGOUT option on the top right of your browser screen. If you get stuck anywhere or need help, please send us an email.